MVCTC Media and Video Production Juniors – left to right Amelia Cayabyab (Wayne), Samantha Haycook (Wayne), Brandon Rader (Milton-Union), Zachary Osborne (Northridge), Grace Ramsdell (New Lebanon). 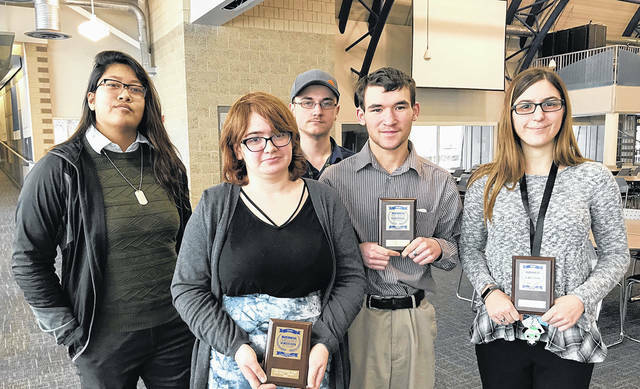 ENGLEWOOD — Miami Valley Career Technology Center (MVCTC) students competed and placed in the Regional Business Professionals of America (BPA) Contest in December and many qualified to compete in the State BPA Contest. The Ohio BPA State Leadership Conference (SLC) is scheduled for March 14 and 15, in Columbus, Ohio. The BPA SLC is the most anticipated event of the Ohio BPA year. The goal of the Workplace Skills Assessment Program is to provide student members the opportunity to demonstrate workplace skills achieved in their career-technical programs. Competition begins at the regional level. Students prepare for and compete in one or more of 60 events in five career pathways Finance, Business Administration, Management Information Systems, Digital Communication & Design, Management, and Marketing & Communication. Top regional qualifiers advance to State, and finally, those deemed the best of the best advance to the National Leadership Conference. Competition includes both individual and team events. 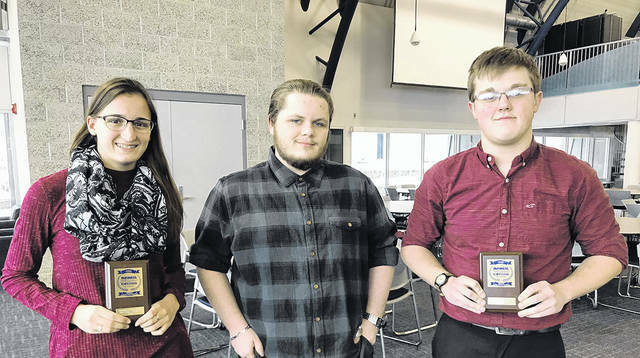 The following students from the MVCTC the Media and Video Production program earned recognition at the 2018 BPA Regional Contests. “The Mission of Business Professionals of America is to contribute to the preparation of global professionals through the advancement of leadership, citizenship, academic, and technological skills,” 2018 Business Professionals of America. The Business Professionals of America, Ohio Association, is the largest state association with approximately 9,000 middle level, secondary and post-secondary members. While the majority of members enroll during their junior or senior year of high school, high school freshmen and sophomores enrolled in approved Career-Technical Education (CTE) programs are encouraged to take advantage of the benefits the Ohio Association offers. The MVCTC Media and Video Production program teaches a blend of computer software applications. Students receive training in the Adobe Creative Suite including Photoshop, Premiere Pro, and InDesign. Before the start of large senior projects, students are also taught skills to create web pages and videos. Students also study the Microsoft Office software – Word, PowerPoint, and Excel. In this program, student performance is based on an authentic assessment. Students are given an overview of the assignment, then are given the freedom to pick their project theme for the given guidelines. Using the skills they have learned, students work on many hands-on projects. A student who is creative and open to individualized instruction excels in this environment. Many graduates of this program continue their education and earn bachelors degrees from four-year colleges or universities. Upon graduation, students will possess skills in several software packages and videography, which will allow them to apply for entry-level positions in the job market.